Someone just asked me which has the better classical music scene – London or New York. It’s a tough call, but after a month in New York, and on the basis of my outings over the last week, I’d say that New York has the edge in terms of sheer quantity of gigs, and their range – even ‘off-season’. Two gigs on Sunday gave some sense of the range of venues available here. At 2pm I was on a barge in Brooklyn overlooking the Hudson River and the skyline of downtown New York. Bargemusic is a tiny, intimate venue which rocks with the water and occasionally bumps into the side of the pier in the quiet bits of music. I was there to see cellist Matt Haimovitz with his colleagues of the Uccello project – arrangements for eight cellos of various jazz numbers by the likes of Miles Davis and Charles Mingus. Haimovitz introduced it saying, ‘If you close your eyes you should hear a big band.’ Although it might not have had quite the volume of brass instruments, the sheer range of sound qualities was pretty staggering, whether the players were imitating electric bass, guitar or keyboard. I certainly never knew how well the cello works as a drum – a few numbers made use of a $50 instrument with two players beating it in just about every available spot – front, back, ribs, neck – to create a whole orchestra of beats. By the end even the octogenarian members of a synagogue tour party from New Jersey were loving it. By 7.30 I was in a nightclub on Bleecker Street. (Le) Poisson Rouge (LPR) is a venue that comes up in The Strad review section regularly, with exciting programmes, so I was keen to go. 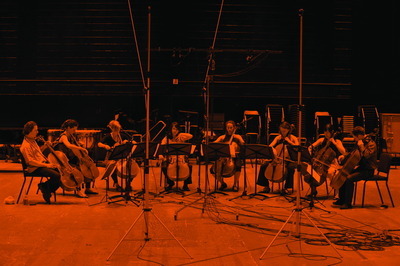 This concert was of shortish pieces and movements performed by musicians from The Academy – an educational project run by Carnegie Hall and The Juilliard. Pärt jutted up against Brahms and there were pieces specially commissioned by Carnegie Hall. With committed and energetic playing, the whole concert had a real freshness and excitement to it that worked perfectly in the packed venue. The question of whether formats such as these are really finding new audiences is a moot one. I’ve certainly seen similar programmes in nightclubs in London – even more challenging ones, at that. For me what was interesting about this model is that it is essentially the same as the high-end jazz club – people are seated at tables and encouraged to be respectfully quiet. And there’s a two-purchase minimum per head, and with inflated drink prices that most club goers are happy to pay, you can see how LPR can make the model viable in a way that London events I’ve been to haven’t quite cracked. Earlier in the week I heard more traditional fare at Lincoln Center with Pinchas Zukerman directing the New York Philharmonic, performing Bach and Mozart concertos and conducting Stravinsky and Mozart no.39. If you wanted to teach an alien the violin, you could do no better than show it video of Zukerman – I can think of no one who plays with such ease, in both hands, in the production of a sound that is almost too big for the violin yet equally tender when it needs to be. Zukerman’s trucklessness with Baroque style is well known, and this was muscular, operatic Bach, but who cares about authenticity, when it sounds like that? It came as a surprise to me that Zukerman was going to perform the same programme four times altogether, as part of the way US orchestras run subscriptions. That’s certainly not something that would happen in London – a couple of performances for a top star, maybe – and it did make me curious as to how it feels to perform the same concert so many times in the same place. Things had been even more traditional on Monday night, at the Landmark Tavern, for its regular Monday night jam session, where 20 or so people with various instruments and various amounts of skill joined together in traditional Irish folk melodies. With such an intimate, democratic and inclusive atmosphere, I couldn’t help wondering how classical music could replicate this model. Mendelssohn Octet free-for-alls in a pub anyone? It’s not as if we don’t have the shared knowledge of repertoire that folk music has – we might just need some music. And to share the limelight with allcomers – maybe that’s the sticking point. So, this was only a week in the musical life of New York, representing only a fraction of what’s available. My explorations continue and I’d welcome any suggestions for interesting venues or programmes.